Knowing that most people only read the first and last paragraphs, and then look at the score, I want to get this out of the way regarding Spider-Man upfront; Spider-Man is a lot of fun. A lot of fun. 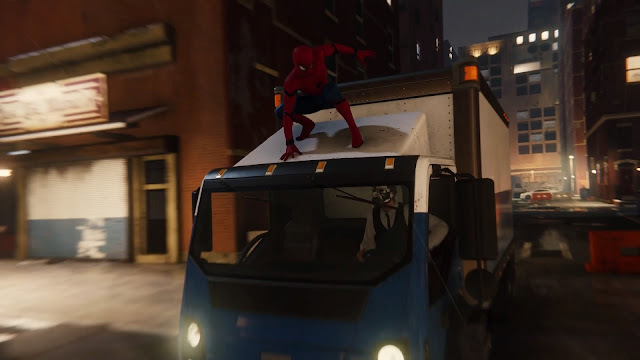 The combat feels great, as does web-slinging around New York. In fact, the developer has done an absolutely stand-up job of making the act of pressing buttons as enjoyable as possible. And for that reason, knowing that most people aren’t that interested in substance beyond the raw entertainment value of a blockbuster release like this, I have to give this plenty of thumbs up. I enjoyed it for what it was, and can’t really imagine any way that the developer could have improved on the formula that it has gone with. 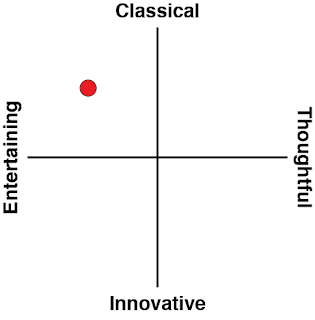 That's not to say I liked everything about it, though. Keep the above in mind; I know I need these disclaimers because as a PlayStation exclusive, if I’m not adequate demure in my criticism I’ll get a flood of angry responses. Spider-Man really is a lot of fun. But – and it’s a big but – it’s also emblematic of everything wrong with the "AAA" or blockbuster space. It’s shallow, it’s an exercise of shoving a license into the commercially-decided “best practice structure for content" to ensure a “fun video game,” and it’s an utter waste of time. It's a stream of marketing and sales phrases spun into a highly commercial and corporatised product, designed to appeal to everyone and challenge no one. If this is the best that video games can offer – and I'm sure a lot of people will rate it right up there – then it’s a sad reflection for how video games have evolved. Let’s start with just how shallow it is. Going in, I knew not to expect too much from Spider-Man. It is, after all, a mass-market comic book property. Marvel stories generally offer a strong moral centre and message, but aren't well known for having an interest in philosophy or nuanced insight in the delivery of those morals and ideals. But Spider-Man still surprised me with how shallow it really was. For context; I recently watched the first Infinity War film for the first time. I found it to be a blockbuster of the most spectacular of scope, but despite the expense of that film, I was reasonably impressed that in between all the big action and exotic sets, there was still an attempt to give people something to think about. Thanos' motivations, for example, gave audiences the best galactic-scale application of the trolley problem that we've seen in quite some time. Conversely, and without giving away spoilers, Spider-Man’s big “thinky” moment was also an application of the trolley problem, but instead of asking audiences to muse over exactly what is right and wrong, this was played purely for a cheap emotional impact. It was, in fact, a disingenuous and overly leading moment that was less interested in encouraging the audience to think, and more designed around presenting Spider-Man as that much more the hero because he needed to make a “difficult choice”… but scratch away the surface, and that same difficult choice really had no rational alternative outcome. As such, it was less a thought puzzle and more a commercially-designated "key plot point" - a safe and easy scene that the writers could be reasonably sure their audience would interpret a decision "correctly" and be emotionally invested in the "right" way. Elsewhere, through most of the experience, rather than thought and reflection, Spider-Man features a gauntlet of villains to take down among ever-escalating set-pieces. Sadly, most of those villains will only be of any interest to the most committed of comic book fans, and don't provide the most interesting characters at the best of times. They are the highlight though, because when not fighting them, there's a map filled with an endless stream of icons to chase down. Oh... there are so many icons. You’ll start by hunting down backpacks that are scattered all over the place. Then you’ll need to indulge in some “base capture”. 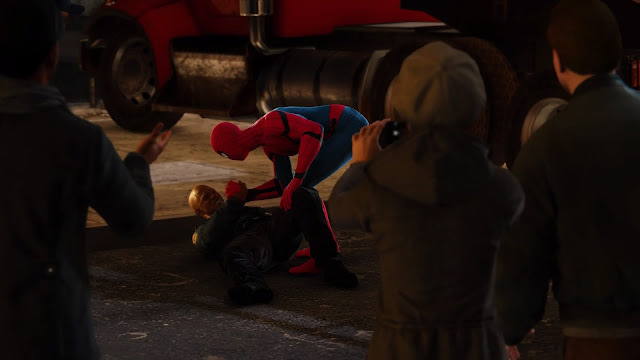 Then there will be short instances of street crime to deal with - sometimes you'll be beating up baddies, and at other times you'll be doing non-violent things like rescuing people from car crashes. And then there will be places to take photos of memorable locations throughout New York. Then there’s “science puzzles” to solve, and cat dolls to spot throughout the city. And so on and so forth. In terms of raw content, Spider-Man doesn't ever seem to actually finish, and just as you feel like you're getting on top of this side stuff, a new set of icons will be thrown into the mix. But here’s the problem with this – all the stuff you do in Spider-Man you’ve done in other open world games in the past, in almost the exact same form. Spider-Man isn’t so much a franchise that has had a game built around it as a predetermined gameplay formula that has had the Spider-Man franchise shoved into it. It feels like such a superficial treatment of the property. 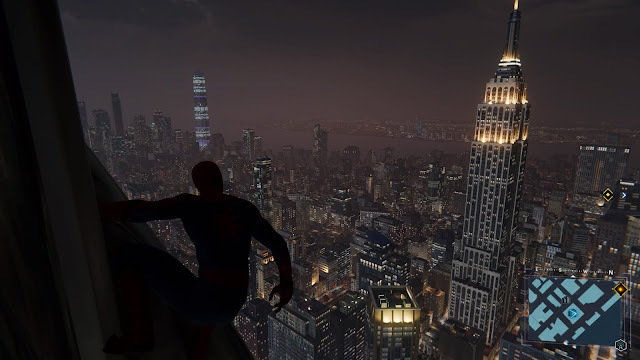 Yes, swinging around the city is marginally more fun than driving around it (especially since in Spider-Man the city's “ground floor” is exceedingly dull), but at each and every end point - at every icon that you'll come across, you’re doing stuff you’ve already done in dozens of other games, and, more significantly, you'll be doing them in almost exactly the same way, too. It's hard to blame Spider-Man itself for this though. Open world games are a disease, and commercial reality at the moment is that "open world" sells copies. It's a commercial selling point for a reason, yes, but it does nothing good to most of the games that are straddled with it. Originally “open world” promised genuine immersion; the ability to experience an entire vibrant world, and then interact with it in whatever way you see fit. Somewhere along the line, though, rather than use improving technology to make the worlds more authentic, developers instead realised that they’ll make more money and keep the “hours played” counter ticking if they provide players with irritating busywork. The more busywork there is, the more "gameplay" players get, and the more hours of content there is, the happier the consumers tend to be. You’ll have to do a lot of these side distractions in Spider-Man, because an expanding range of suits to wear, as well as suit ability unlocks, are tied to “tokens” that you earn for each completed icon. Unfortunately that has the side effect of slowing down the pace of the main narrative. 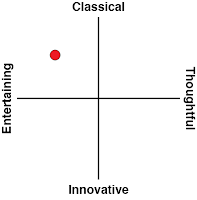 And when the main narrative is that shallow, the last thing it needed was to be paced poorly as well. Spider-Man’s lack of subtlety plays right through to the web-swinging across New York. You know the little musical theme that plays at the start of most Marvel films? The strings-heavy tune that grows and swells in the promise of something epic to come? That theme plays each and every time you start the web-swinging. The first couple of times it had the intended effect. It added to the excitement that you are indeed playing a Spider-Man game and whooshing through the city with all the freedom of the ultimate swing ride. But that impression doesn’t last long. After the dozenth time it starts to feel like a sledgehammer effort by the developer to force you to remember to be exhilarated at how big and cinematic the game is. Tonally, the developers have really nailed Peter Parker’s love of youthful wordplay and banter as he goes about his work. The way he banters with a police detective and narrates the adventures of “Spider Cop” early on was a perfect example of a character quirk that really sets Parker apart from others in the Marvel stable. Indeed, it's a big part of the reason that Spider-Man would have to be my favourite Marvel hero of all. But even here there are problems. Parker loves bantering while in the middle of a scrap, but the fights require focused concentration on the part of the player. 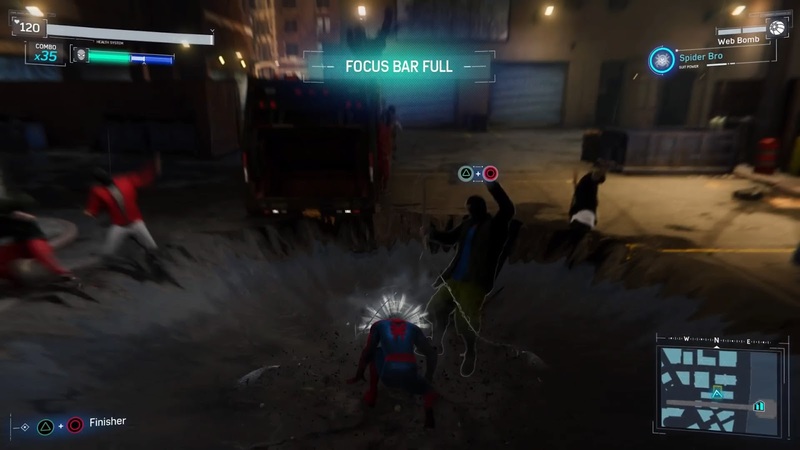 Combat is a complex mix of brawler commands with a heavy focus on ducking out of the way the moment an icon appears above Spider-Mans’ head, and it's the kind of system where split seconds can count. As a consequence of that, it's hard to stop paying attention to what's going on in order to appreciate the jibes and humour written into the script. The fundamental difference between films, where audiences are more passive and can therefore devote more attention to listening while there’s action going on, and games, is that when a player's a participant in the action they can't really focus on anything else. But, for all that, I must emphasise, again that I found Spider-Man is genuinely fun. That combat system really does flows so beautifully, in a way that really refines everything that the likes of Assassin’s Creed and Batman started a generation ago. Ducking, diving, countering and throwing webs take a while to master in combination to one another (mostly because there are almost too many combinations to choose between), but as you get the hang of it, the rhythm that Spider-Man’s combat enables is something else entirely. Wisely, the developers make sure that another opportunity for combat is never too far away (even if it is just another one of those distracting icons) so it's actually very difficult to actually put down the controller. I don't like using terms like "addictive" to describe games, but Spider-Man certainly has the "just a few more minutes" appeal going for it. There are stealth sections, too, and they’re enjoyable, albeit work a little too hard to appease players and convince them of their incredible ninja skills. Spider-Man has all kinds of tricks to silence and distract his opponents, and while the AI is far too static and rote to make for genre-defying stealth missions, playing around with the extensive Spidey toolbox in these scenes never got old. In fact, because the stealth and combat sequences are all explicitly built around allowing Spider-Man the creativity to use his full range of abilities, it’s no coincidence that these moments where the game genuinely feels like the proper Spider-Man experience that everything should have been. So, for my complaints above, there is nothing wrong with Spider-Man. Indeed, it would be ridiculous not to recommend this to anyone looking for a good time. 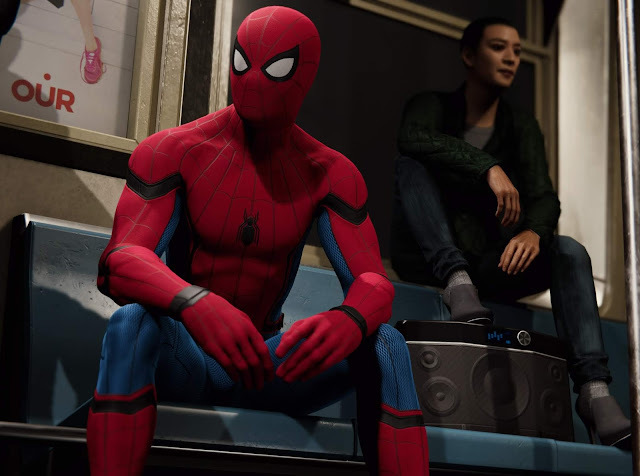 The developers set out to give players an open world game with exciting web-slinging and a combat system that is distinct to Spider-Man’s character, and the team absolutely nailed that brief. There's also so much content in there that people who want to get that all-important 100 per cent completion have many hours of play time to look forward to. The value of Spider-Man as entertainment can't be questioned, but given that this is a blockbuster experience that has brought in a mammoth amount of resourcing, it was also always going to offer that. Spider-Man was never not going to deliver on its promise, and as much as I enjoyed my time with it, I still hold out hope that at some point the industry will start to question whether empty, superficial fun really is the peak of what its biggest projects can offer.